Update: NKE – Just Did It. 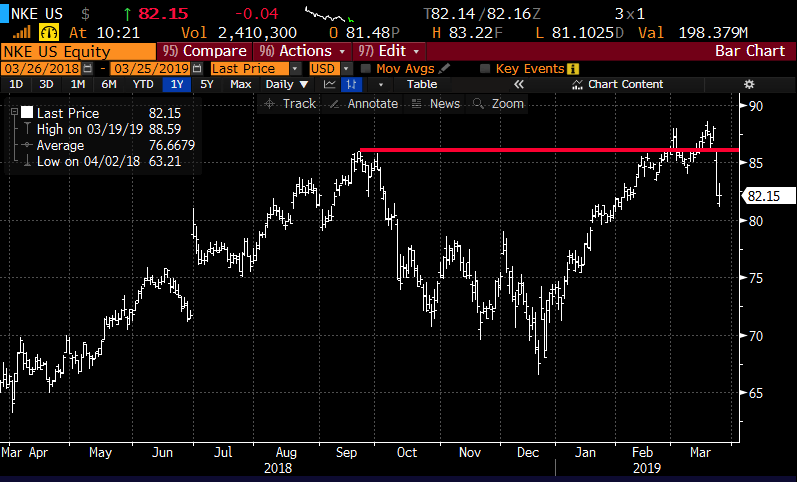 On February 15th, when shares of Nike (NKE) were near $85, and threatening a new all-time high, I detailed reasons why I thought their upcoming guidance would disappoint and why the stock might be on the cusp of making an epic double top (Nike – Involved in a Trade War in Asia? If trade negations were to take a turn for the worse, investors might start to reconsider the potential for follow-through of the positive commentary that NKE last gave on their Q2 earnings call on December 20th (when the stock was in the high $60s). What stuck out from their Q2 results was the 31% year over year sales growth in China, 14% sales growth in Europe and the Middle East, and the 9% sales growth in North America. I guess what’s important here is the timing of their earnings and guidance, a couple days before the U.S. government shutdown and two weeks before Apple’s massive revenue preannouncement that was largely blamed on weak sales in China. NKE gets 60% of their sales outside the U.S. and the combination of trade tensions weighing on the global economy and the strength of the U.S. Dollar, any lack of clarity on the withdrawal of tariffs might start to weigh on U.S. multinationals like NKE. Oh and NKE trades about 32x the current fiscal 2019 eps estimates for growth of 12% and 27x FY2020 expected eps growth of 18%, which might be a tad high given the start of the global economy. Well, the company did disappoint on guidance, but the stock also rallied a few percent in the weeks prior, and now the stock is back at $82.15, the level this trade idea would be at break-even on April expiration in a few weeks. This trade that cost $2.50 when the stock was $85.25 is now worth $3.40 at current levels for an 80 cent profit.